Bandar Sunway, 26 Nov 2010 - It was a kaleidoscope night of colours, music and lights at the Gala Premiere of Peter Pan The Musical @ Sunway Lagoon. Performed at the newly refurbished Amphitheatre, the musical production is a first collabaration between local and international talents who are no strangers to the stages of West End and Disney. 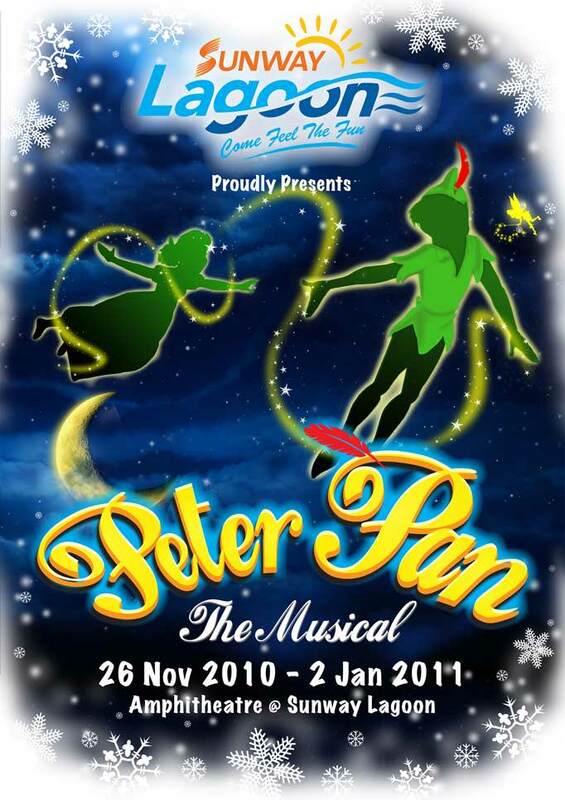 Peter Pan The Musical @ Sunway Lagoon is a West End Production which tells the age old story of a boy who just would not grow up. Amidst the levitation and flying antics from Peter Pand and his friend Wendy, the evil Captain Hook adn the ever-loving Mr Smee, the crowd of nearly 2,000 people were mesmerized by the unique lights displays, pyrotechn ics, snow ( yes, snow !) and vibrant performance from this world-class production. "With this being our first ever theatrical production, we are working hard to set the benchmarks for future theatrical events held here. This production of Peter Pan the Musical has many unique elements that have yet to be experienced by people in this country. This unique location aims to provide our audience with the full-bodied experience of modern day, musical theatre. It is not just about sights and sounds; it is also about stirring up the myriad of emotions this unique ambience invokes", said Aaron Soo, CEO of Sunway Lagoon. Directed by Chris Colby, who have been involved in musical productions such as Aladdin, Cinderella, Beauty & the Beast, Oliver! and Annie, he leads a 16-member cast line-up who hails from Europe, South America, the Philipines, Indonesia and of course, Malaysia. "Sunway Lagoon has really gone above and beyond with this unique set prodcution. The performers, choreographer and I have agreed that it is truly, a one of a kind display of creative talent in set production. As many people in show business know, the stage set, sound, lightings and special effects really can help bring the audience to the realm where the play is set, " said Colby. Choreographer of Peter Pan The Musical @ Sunway Lagoon, David Kort says that the set has really helped the performers to get into character while doing the show. Kort has led international productions of musicals such as the Jack and the Beanstalk, Annie and Treasure Island amongst many, many others. Internationally recognized for excellence, Sunway Lagoon is the only Attraction in Asia to be recognized by the Association of Amusement Parks and Attractions (IAAPA) as 'Asia's Best Attraction' for four consecutive years from 2007-2010. Most recently, the Games & Parks Industry magazine in Europe awarded Sunway Lagoon with the 'European Golden Pony Awards' for their contributions to the growth of the Asian Amusement Parks and Attractions industry. The Gala Premiere of Peter Pan The Musical @ Sunway Lagoon also saw the re-opening of the Nite Park, which was closed to accommodate preparations for the year-end, yuletide theme. Guests were seen re-living the sights and sounds of 'Neverland' at the Nite Park after the Show. For bulk ticket purchases, please call 603-5639 0191 ( Ms Low Chin Yee) or 603-5639 0186 (Ms Sharifah). For live updates, connect to Sunway Lagoon on www.facebook.com/sunwaylagoonMsia or www.twitter.com/sunwaylagoon1. Peter Pan The Musical @ Sunway Lagoon was made possible with the support of the following sponsors and partners: Crocs, Public Bank, myc!, All Malaysian info, Nestle, Sunway Pyramid, Tourism Selangor, Majlis Perbandaran Subang Jaya (MPSJ) , Majlis Bandaraya Petaling Jaya (MBPJ), Majlis Bandaraya Shah Alam (MBSA) and Majlis Perbandaran Ampang Jaya (MPAJ). * Public Bank cardholders enjoy 40% discount off ticket prices.